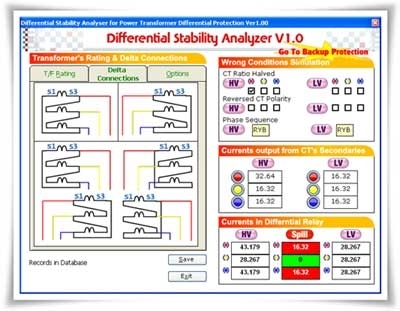 Description of Freeware (Last Update: 29 January 2008) :Differential Stability Anlyzer is the single free tool available on internet of its kind.Differential Stability Anlyzer is used to predict the effect of C.T.Ratio change , C.T.Ploarity change , Phase reversal , wrong Delta configuration ,Open circuit in differential circuit.It automatically calculate the HV current,LV current & Operating currents probably to be seen by the differential relay in realistic conditions. During an unstable condition of Differential Protection of Power Transformer, we can simulate the possible causes by this software.We can save the current patterns for a different situations and can search a situation from the database in future by query.It is a handon tool for Every Electrical/ Power Engineer / Student for studying the various factors which affects the Differential Protection Stability of Power Treansformer.It also includes module for Overcurrent/Earth fault settings. Following conditions may be simulated by Differential Stability Anlyzer. This entry was posted on March 23, 2008 at 8:56 am and is filed under software. You can follow any responses to this entry through the RSS 2.0 feed. You can leave a response, or trackback from your own site.